Bunions are a progressive deformity mostly affecting women that usually do not show any symptoms but, can be quite unsightly and uncomfortable, particularly when the incorrect footwear is worn. If you enjoy running as a sport or hobby and suffer from this condition, it is advisable to obtain a good running shoe that will not aggravate the bunion or cause more bunions and bunionettes (a bunion on the little toe). A common bunion consists of enlargement or prominence of the inner portion of the joint at the base of the big toe; this can also occur at the small toe, which referred to as a bunion sette. The enlargement is in actual fact just the misalignment of the big toe joint or in some cases additional bone formation. This deformity tends to be progressive and can increase with time, although the symptoms may reduce. Symptoms such as inflammation, pain, redness, and tenderness in the enlarged joint or bone formation can occur, and arthritis can develop at many later stages. There are many assumptions as to how Bunions are caused, but the exact cause of a Bunion has not been discovered as of yet. Tight fitting and narrow toe shoes. High heeled and pointed heel shoes. Health conditions such as arthritis, rheumatoid arthritis, and other inflammatory conditions. A bulge or bump on the outside and base of your big toe or little toe. swelling, pain or redness around your big toe joint. Corns or calluses may develop when your first and second toes overlap. Persistent and intermittent pain in the toe joint area. More restricted movement of your big toe. When you have persistent big toe or foot pain. The bump on your big toe becomes much more visible. You are unable to move your big toe or foot or have very much difficulty in doing so. Bunions may not always cause serious problems but they are permanent unless they are surgically corrected. Bursitis; a painful condition that occurs when your small fluid pads or bursae which cushion your bones, tendons, and muscles near your joints become painful and inflamed. Hammertoe; the middle joint of your toe becomes abnormally bent causing pain and pressure. Usually, the toe next to your big toe will be affected. Metatarsalgia; pain and inflammation in the ball of your foot. Bunion pain can be mild or quite severe depending on how inflamed the bunion is and the pressure of the big toe pushing against other toes. Shoe inserts can be used to position your foot correctly and to provide arch support which will reduce the severity of bunions as well as prevent them. Non-steroidal anti-inflammatories and warms soak or ice packs will reduce the pain and swelling caused by bunions. The most important factor in treating and preventing bunions is the correct footwear that has a wide enough toe is to accommodate bunions and soft and flexible uppers. Roomy shoes with broad and deep toe boxes, flatter heels and good arch support will prevent and reduce bunions. Always avoid tight and narrow fitting shoes with high heels or any type of shoe that puts pressure on your big toe joint. Here are a few steps that you can take in order to prevent Bunions from growing further and becoming worse or more inflamed. Opt for shoes with a wider, square or round toe box with plenty of toe wiggle room and a small or low heel. Make sure that your running shoes have a wide and flexible toe box, good arch support and a well-cushioned heel. A snug fit around the Heel and plenty of room in the forefoot is ideal for someone who suffers from Bunions. You can cover the Bunion with a pad that is sold at most drugstores to prevent friction against your shoes. Give your feet a break during the day by taking your shoes off and not wearing heels for longer than three hours at a time. You can have your shoes stretched or modified by a shoe repair shop, and they can also smooth out rough edges that cause irritation. The right orthotics for your type of pronation particularly overpronation can also reduce the severity of a Bunion. Stretching and strengthening different parts of your feet such as stretching the Achilles Tendon to counter stress on your forefoot is also helpful. Calf stretching is crucial for women who like to wear high heels, and big-toe pulls, and stretching is great to strengthen your toes. By following these tips and taking good care of your feet, you can prevent Bunions from developing as well as reduce the symptoms such as pain and inflammation caused by Bunions. Wearing appropriate running shoes with a wider and softer or more flexible forefoot and the toe box is essential when you have bunions or similar foot conditions. A tighter heel is also an advantage in a running shoe for Bunions because it keeps your heel and ankle in pace preventing slipping while still providing ample toe room. A wide and deep toe box that allows your feet to spread out. Little or no elevated heels. The Asics GT-2000 is a well cushioned and stable running shoe with a supportive and comfortable fit that will reduce strain on your feet and toes. The uppers are lightweight and flexible manufactured from textile and synthetic materials that also improve breathability. Rearfoot and forefoot Gel, as well as a Fluidride Midsole. Impact Guidance System for support and shock resistant. A more wide fit and roomy toe box allows you to spread out your toes and reduces pressure on your toes. The rearfoot and forefoot gel cushioning system provides comfort and shock absorbency for a high-intensity workout session. A stabilizing Duomax support system provides stable arch support and keeps your foot well aligned. The durable rubber outsole offers excellent traction on hard floor surfaces. Different colors are available to choose from. The Altra Torin provides a unique extra wide fit toe box uniquely designed for people with bunions and hammertoes. This shoe also offers stability and speed when you need it the most for your best performance yet. The extra-wide toe box offers ample space for your feet and toes and prevents friction during intense training sessions. A FootPod outsole fits and maps your tendons and bones for more natural, flexible movement and comfortable fit. A double level EVA midsole and contoured footbed provide excellent cushioning and support while absorbing the maximum amount of shock. A high quality and durable shoe for the best performance with the most comfort and support. Available in many different color options to suit your personal needs. For a running shoe that combines a lightweight feel with stability and comfort the Salomon X-Mission will not let you down and keep you comfortable and well supported for a fantastic running experience. Soft and flexible mesh uppers and a wider toe area provide the much-needed relief from the painful symptoms of bunions. The Sensifit and Sensiflex technology ensure smoother motion and a more comfortable fit. A rugged and durable contra grip outsole will ensure excellent grip and traction for outdoor surfaces. The quick lacing systems give you a fast and customized fit. This trail running shoe has a variety of color options available. The Saucony Omni 16, a light-duty running shoe that provides optimal support and cushioning for the overpronator. The soft and flexible uppers accommodate conditions such as bunions and hammertoes by reducing stress and strain on the toes and allowing for more movement space. This shoe is excellent for overpronators and flat feet as it provides good arch support and is very well cushioned, in the top-sole with the EVERUN cushioning technology. The speed lacing system ensures a secure and personalized fit in no time. The soft foam in the heel absorbs shock and reduces the impact on the feet. A perfect running shoe for relaxed and casual runs. Many colors are available for every preference. The New Balance 1540V2 is available in wider widths for more toe room and provides lateral and medial rearfoot stability for better motion control. Flexible and lightweight synthetic uppers with breathable mesh panels and a dual-density foam collar ensuring the most comfortable fit. A 10mm heel to toe drop for improved stability and motion giving you better performance and fewer injuries. This shoe is available in wider widths and larger sizes to accommodate any foot type and foot condition. The Mizuno Wave Rider is a flexible running shoe that caters specifically for people who suffer from Bunions, ensuring a more comfortable a smooth running experience. The lace-up uppers have been designed specifically to allow for a more adjustable and flexible fit with less friction during walking and running. The uppers are manufactured from breathable and innovative mesh that suits the shape of your feet and keeps your feet cool and dry. The Dynamotion Fit technology also ensures a more flexible and seamless fit for less irritation and pressure on the feet. This shoe provides ample support and cushioning for a neutral runner and has a durable high traction outsole. The Brooks Adrenaline GTS is not just a comfortable and breathable running shoe but is also available in wider widths to provide more toe room particularly for foot conditions such as Bunions and Hammertoes. Breathable and comfortable mesh uppers with an adjustable saddle design for a more customized fit and targeted support. The extended Caterpillar crash pad allows for full ground contact and better heel to toe transition. The Element linings are breathable, wick away moisture and lessen irritation keeping your feet dry and completely fresh and comfortable. HPR Plus technology delivers more long lasting durability in high wear areas. The Omega flex grooves allow for more natural foot movement and improved fluidity. The Brooks Adrenaline GTS is available in many color options and different width sizes. The Asics Gel Foundation is a comfortable and supportive Motion Control running shoe that is breathable with seamless construction for less irritation. The uppers are made from durable mesh and synthetic materials that improve breathability to keep your feet dry using seamless construction methods to prevent chafing and irritation. A supportive Speva midsole that returns energy to your feet. The ComforDry Sockliner provides moisture wicking capabilities to keep your feet dry, cool and odor free. A dual-density DuoMax support system midsole provides exceptional cushioned comfort and support. The DuraSponge outsole is durable and ensures excellent shock absorption. The Asics Gel Foundation 13 provides exceptional motion control and is a great choice for overpronators. This running shoe is available in different color options. The Dansko Wayne and Fawnar are fantastic walking shoes and dress shoes, that will offer you optimal comfort for all-day wear. The structure and fit of the shoe will ensure that there is no In pressure on any affected areas for the foot. Full grain leather uppers with a padded collar and elastic gores for an easier fit. A loafer styled dress shoe perfect for every occasion and as a professional work shoe. The cushioned midsole and riveted shank in the Dansko Wayne offer exceptional support and stability. The Dansko Wayne is a slip-on shoe with a Nitro rubber sole for superior traction and good shock absorbency. The Dansko Fawna features a removable EVA footbed with natural arch support technology. The integrated insole in the Fawna has a tuckboard and steel shank for improved stability and support, and the interior is lined with breathable textile materials. The Propet Olivia and Propet Cush N Foot is a therapeutic slip-on shoe with a sleek and sporty look for everyday casual wear. This shoe accommodates orthotics and has an adjustable strap for a customized fit. You can be sure to walk comfortably and securely in the Propet! The uppers of the Propet Olivia are manufactured from soft, flexible leather with a stretchable vamp and the Cush N Foot of Synthetic Material to ensure there is no pressure on the affected areas. The removable insole allows you to use your orthotics. An adjustable strap gives you the best, customized fit. A built-in heel counter provides extra support and stability. Available in neutral color options. The Aravon Maya is a very comfortable and supportive dress, Mary Jane style pump for women that can be worn for work and more formal events. The Orthofeet Gramercy Orthopedic Men’s Dress Shoe is a comfortable shoe for a more professional look. Both these shoes offer superb comfort as well as an adjustable fit to accommodate any foot condition. The Merrell Captiva Launch 2 and Merrell Turku Chelsea are very stylish and fashionable waterproof boots. The broader toe box on these boot ensures that there is minimal pressure on your toes and that you have a wider and roomier fit which is an excellent feature if you have bunions. This boot is completely waterproof. You can not go wrong with sandals to prevent Bunions or reduce Bunion pain. Because of the open structure of a sandal, there is less strain on the toes and forefeet which will reduce your chances of getting a Bunion and also help to prevent pressure on Bunions that are already there. Keep in mind to find a comfortable sandal that provides good underfoot cushioning as well as soft and flexible uppers or straps. The Keen Sports Sandal is a comfortable and breathable sandal, that has an adjustable and flexible fit. The uppers are breathable and offer a flexible fit. A sporty style sandal with a bungee lacing system. Features a compression molded Eva Midsole and a hydrophobic mesh lining. the outsole is non-marking and has razor siping for better grip. A wide toe area with adjustable uppers to accommodate Bunions and other foot conditions. Bunions are bony bumps that form on the joint on generally only at the base of your big toe but sometimes can also develop on your small or other toes. A bunion develops when the big toe is pushed against the other toes which in turn forces the joint of your big toe to stick out and form a growth. Usually, the skin around a bunion can become inflamed and very painful especially when there is pressure against it from footwear. The smaller bunions that form on the little toes for the same reason are called bunionettes and can be just as painful and uncomfortable. A Bunion is a very painful foot ailment that can be quite debilitating. Bunions can develop on one foot or both, a protrusion of bone making the toes bend inward in a weird shape with sharp angles giving the foot the overall shape of a diamond. Then comes that little issue that I cannot avoid called Bunion Shame, it is a real problem that can cause much embarrassment. The shame and embarrassment that you may feel because of Bunions cause you to hide your feet under socks and closed shoes even in the hottest of weather. Summer is a dreaded time of year as not only you can’t wear those glorious and breezy sandals because of the sight of the Bunions but also because my feet won’t fit through the straps that many sandals have. Bunions are usually not a frequent topic of conversation, maybe because of their unusual appearance awful sounding name but they are a common foot ailment. Bunions affect an estimate of 23% of adults according to studies, and contrary to popular belief they do not only affect women but men as well. Women though have a higher chance of developing Bunions because they are more likely to wear high heeled pointy shoes that I have noticed is one of the biggest causes of Bunions. Fortunately, for all of, us Bunions can be removed by surgery, although not everyone with Bunions will require surgery. There are many methods to manage Bunion pain as well as reduce swelling and prevent further or initial development. Things such as anti-inflammatory drugs, padded shoe inserts or shoes that accommodate Bunions can provide much pain relief. I have found that avoiding shoes that squeeze the toes or feet or that have high heels and pointy toes are one of the greatest methods of preventing Bunions and eliminating aggravation. Bunions are caused by uneven pressure being applied to some of the joints and tendons in your feet, the imbalance of pressure and heavy or shifting weight weakens the joint usually in your big toe causing the joint to mold into a hard bump which protrudes from the foot. It has not yet been proven if narrow, tight or high-heeled shoes can contribute to the formation of bunions, although it is advised to avoid these types of footwear especially if you already have a foot condition or injury. Most foot conditions are caused by an injury or are hereditary, in some cases a birth defect. When you perform frequent activities that put a lot of strain on your feet and big toe, it can also lead to a bunion. There are medical conditions such as arthritis that can also cause bunions and other foot conditions and deformities. While surgery is your last resort in the treatment of painful bunions, there are other methods that are also great solutions to treating and managing bunions. The correct footwear for bunions can relieve the pain associated with this condition, reduce further damage and help to heal the condition. A wide or medium toe box that keeps the toes in their natural position. Good support and arch support especially if you have a flat foot, orthotic inserts can also be used. Make sure the shoe is well padded and that there is no pressure on the foot’s joints. A sturdy heel counter that will keep your heel comfortably in place. Soft and flexible upper materials that will not add any pressure to your toes or forefoot. A slight heel for better stability and support but avoid high heels at all costs. Sandals, Athletic shoes, and soft leather shoes are your best options. A Bunion is basically a growth or deformity that forms at the base joint of your big toe. The exact causes of Bunions are not quite clear although improper fitting or narrow toe shoes do have a hand in the formation of bunions. Ill-fitting footwear can also cause much irritation and inflame a bunion. My advice is to wear good shoes that fit properly when suffering from Bunions. There are many treatments available today to relieve the pain and symptoms caused by Bunions many I have found to be quite effective. Wearing the correct footwear that does not place pressure on the Bunion for me, most definitely aids in reducing these symptoms and relieving pain. Most Bunion treatments have proven very successful but in some cases, surgery may be necessary. Bunion surgery is your last resort when all other treatments have failed. You may need to consult a physician if you have persistent Bunions that cause severe pain. Your big toe joint or the area surrounding it becomes painful, red or swollen. Corns and calluses may also develop where the first and second toes overlap. There is a persistent or intermittent pain in the big toe joint area. You are unable to move or find difficulty in moving your big toe. My doctor prescribed some medication and recommended over the counter pain relievers as a treatment to relieve the pain and reduce inflammation of my Bunions. I have also used a heating pad or warm footbath to relieve the pain and discomfort as well as ice packs, particularly in the areas where there is swelling. The most important factor in the prevention and treatment of Bunions is wearing the correct footwear. Shoes that are well made and fit properly with ample toe room will do the trick. Good arch support and cushioning or the use of a supportive and comfortable orthotic insert can also aid in the treatment of bunions as well as many other foot conditions. In the worst, case scenario, an orthopedic expert or podiatrist can prescribe shoes for you that are specifically designed to take the pressure off the affected joints and help to realign the foot into its proper shape again. The last resort for very painful Bunions that are persistent is usually surgery, but this is only required in the most severe cases. The pain in your foot or big toe becomes more persistent and severe. The size of the bump on your big toe increases and becomes more visible. You are unable to or struggle very much to move your big toe or foot. You cannot find shoes that fit properly anymore because of the Bunion. I cannot stress this enough; the most important step that you can take in the prevention and treatment of a Bunion is to invest in well-fitting proper shoes. I have read that Bunion shoes are shoes that have been designed specifically to prevent strain and inflammation of the big toe joint to prevent and treat bunions. So I would suggest that you Invest in a good pair of shoes for Bunions Shoes. Bunions can be dealt with effectively, and the pain can be reduced by following the steps mentioned above, although when the pain and severity of the bunion persists, I would advise you to consult your physician. In my experience, Bunions, when treated and managed, can become less severe and even cured, but without proper treatment or wearing of the correct footwear bunions can become more aggravated and cause serious damage and pain. There are many steps you can take to prevent Bunions from forming and to reduce the symptoms caused by Bunions that are already there. Every step that you take flexes your metatarsophalangeal joint, and any motion that is repetitive such as running, walking or even standing can aggravate your ligaments, joints, and tendons. This repetitive movement usually results in inflammation and swelling as well as cartilage damage which further develops into conditions such as Bunions and arthritis. When I compress my foot in a shoe that is narrow, ill-fitting and has high and pointy heels Bunions, calluses and corns may form, or existing conditions can become more aggravated and painful. If you suffer from certain diseases and conditions, it can hasten the deterioration of your joints and ligaments that surround your big toe which in turn causes Bunions to form. I have read that Rheumatoid arthritis is one of the most likely conditions that can degrade cartilage to the point where it will aggravate a Bunion, increasing the severity or causing the formation of the Bunion. I have followed these very simple steps that will help to prevent the further development of a Bunion. It is best to take action as soon as you start noticing any symptoms to get the best results. Wearing footwear that has a molded or cushioned footbed with lots of toe room and a low heel, in which I can easily wiggle my toes in and that it fits properly. Shoes with laces or a Velcro strap allows me to adjust the fit and prevents my feet from sliding in the shoe which could put trauma on my joints and toes. Sandals and training shoes are normally the best options for me; trainers also provide excellent support and shock absorption. I have not had to use them myself but you can purchase over the counter orthotic inserts and splints or get a prescription from your podiatrist. A splint is a device that keeps your big toe in a straight line and stabilizes it while and insert provides support and cushioning. Bunions are a common foot problem that affects almost 90% of women and 10% of men. I have found that taking the right steps and wearing the right shoes can not only reduce your chances of getting Bunions but also stop Bunions from further forming with the first symptoms. For me wearing the correct footwear is one of the first steps in preventing bunions as well as preventing them from becoming worse. I always make sure to choose shoes that fit well and provide ample toe room in order to reduce strain on the toe joints preventing Bunions from forming or becoming worse. Pain from Bunions can be excruciating and debilitating along with causing significant discomfort when walking or standing. There are a few ways that you can manage and eliminate bunion pain effectively. A bunion is a condition that mostly affects women today. From what I have noticed tight fitting and narrow-toed shoes with high heels are the biggest culprits in Bunion formation. Tight footwear can also severely damage and increase the pain and inflammation in already formed Bunions. I have also noticed that when I prevalently wear closed shoes, Bunions are more likely to form or become aggravated, which is not the case when I wear sandals or go barefoot. Bunions may or may not cause any symptoms, but one of the most frequent symptoms that I have seen with Bunions is foot pain when walking or wearing shoes, that are typically reduced when wearing wider or open shoes. Besides just the ill-fitting, narrow toe high heeled shoes, shoes with flimsy and very flat soles can add stress to Bunion joints and increase the pain in this area. Do not forget or get confused; there is a condition called Gout or Gouty Arthritis that can also cause pain at the base of the big toe, this mostly occurs in postpubertal men and postmenopausal women. Therefore as I can conclude, Wearing the correct footwear that fits properly and provides adequate support and cushioning is one of the most important factors of preventing Bunions and other foot conditions. I always avoid footwear with narrow high heels, narrow toes, and flat or flimsy soles. One of the quickest ways to reduce the pain from Bunions, I have found, is to soak my feet in Epsom Salts for about 15 minutes, Epsom Salts not only relieves the pain but also soothes and relaxes the feet and makes the skin soft and supple. I also do stretching exercises to reduce Bunion pain; sit down and use a strap or your hands to pull your toes towards your body and hold it for about 30 seconds, repeat this exercise a few times and do it regularly. There are also over the counter bunion relief splints that are available at most drug stores that will reduce the stress on Bunions and so relieve the pain. Topical foot analgesics that contain ingredients such as menthol or capsaicin can block pain signals temporarily and give you slight relief. Another great way to find relief for me is to wear footwear that is designed to accommodate Bunions, which will provide the most efficient relief by reducing stress on the Bunion and providing cushioning and support. I have found that wearing stretchable shoes or shoes designed to relieve pressure on Bunions, pain can be easily eliminated. It is normally the pressure caused by tight-fitting or narrow toe shoes on the Bunion that causes most of the pain. Therefore it is imperative to invest in Good Bunion Shoes. The pain caused by Bunions can be successfully relieved by following these useful steps. Wearing shoes that do not aggravate bunions and that provide comfort and support has helped me to reduce Bunion pain, aid in the healing process, and also to prevent further aggravation. I hope the information I have shared with you was useful, as it has been useful to me in my search for relief and prevention of Bunions. Changing my footwear was one of the best steps I could have taken not only for my Bunion but also for the overall comfort of my feet. Q: What is a bunion on the foot? A: A bunion is a bony, lumpy deformity of the joint at the base of the big toe. The bunion will start to make the big toe point towards the other toes on the foot. Q: How does a bunion start? A: Over time, the base of the big toe pushes outward against the first metatarsal bone, which is directly behind it. The result is a bunion – a bony, often painful hump at the base of the big toe. Bunions form at a joint and because your shoe likely rubs against it, a bunion can also cause calluses to form. Q: What is a bunion made up of? A: This bunion is made up of bone and soft tissue. Bunions are among the most common and most painful foot ailments out there. Also known by the medical name hallux valgus, a bunion occurs when your big toe points toward your second toe. This in turn causing a bump or prominence to develop on the inside edge of your big toe and first metatarsal bone. Q: Are foot bunions hereditary? A: Shoes with narrow toes can trigger a bunion, but they’re not the underlying cause. Bunions run in families, because foot type (shape and structure) is hereditary, and some types are more prone to bunions than others. Low arches, flat feet, and loose joints and tendons all increase the risk. Q: What is the cause of bunions? A: Doctors call that bump hallux valgus, but you might know it as a bunion. Bunions form when the bone or tissue at the joint at the bottom of the big toe moves out of place. 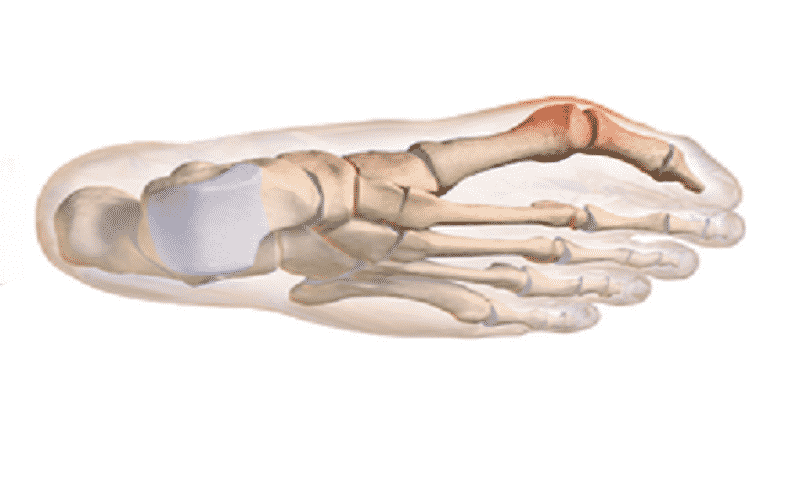 Years of abnormal motion and pressure on the joint forces the big toe to bend toward the others, which causes an often-painful lump on the joint. Q: What causes a bunion to hurt? A: Years of abnormal motion and pressure on the joint forces the big toe to bend toward the others, which causes an often-painful lump on the joint. This joint at the base of the big toe carries much of your weight while walking, so bunions can cause severe and constant pain. An untreated bunion can cause irritation to the fluid-filled sac that cushions the joint, called the bursa. This causes the bursa to become inflamed and swollen, which causes pain and tenderness and may lead to limited movement of the other joints in the toe. This condition is called bursitis. and can lead to toe or foot deformity. Q: Why do bunions swell? A: The misalignment of the big toe can also cause other toes to overlap. The result of this deformity can cause extreme pain and swelling at the protrusion or “bump” and make walking difficult. Bunions do not always become inflamed or painful and it is possible to have the disorder without ever having to seek treatment. Q: What is the difference between corns and bunions? A: Bunion is a bony bump at the base of the big toe mainly due to that the big toe veer toward the others. It throws foot bones out of alignment and can be painful due to pressure or arthritis. It might also lead to corns which are hard, thickened areas of skin that form as a consequence of rubbing, friction or pressure of the bunion on the shoe. Q: Do bunions go away on their own? A: The sad answer is that bunions won’t go away on their own. When bunions left untreated, they’ll just become worse, more painful and harder to get rid of. Although it is not life-threatening, it is an extremely painful condition. In fact, the pain can be crippling if it’s left unattended. Q: How do you stop a bunion from growing? A: Use the thumb rule: make sure that there is a thumb’s width of room between the tip of your big toe and the end of your shoe. Avoid tight, narrow, or high-heeled shoes that put pressure on the big toe joint, they may be pretty but are terrible for bunions. High heels, pointy and narrow shoes lead to additional pain and prevent the bunion from healing. Wear roomy shoes that have wide and deep toe boxes, low or flat heels, and good arch supports. Q: How do I stop a bunion from getting worse? A: Maintain a normal weight. Stay active and practice flexibility-based exercises, like yoga. Protect the bunion from blisters with a moleskin or gel-filled pad. Q: How can I treat bunions at home? A: Apply ice to the joint for 10 to 20 minutes at a time. Put a thin cloth between the ice and your skin. Elevate your foot so that your toe is higher than your heart. Try bunion pads, arch supports, or custom-made supports (orthotics) placed just behind the big toe joint on the bottom of your foot. Q: Can you have a bunion on your little toe? A: Tailor’s bunion, also called a bunionette, is a prominence of the fifth metatarsal bone at the base of the little toe. Q: What causes bunions on the outside of the foot? A: A bunionette is similar to a bunion, but it develops on the outside of the foot. It is sometimes referred to as a tailor’s bunion because tailors once sat cross-legged all day with the outside edge of their feet rubbing on the ground. This produced a pressure area and callus at the bottom of the fifth toe. Q: How do you treat a tailor’s bunion (Bunionette)? Shoe modifications: Choose shoes that have a wide toe box, and avoid those with pointed toes or high heels. Padding: Bunionette pads placed over the area may help reduce pain. Injection therapy: Suggested treatment is PRP. Orthotic devices: Reduce pressure on the fifth metatarsal head and rebalance the foot. Q: What is involved in bunion surgery? A: Bunion surgery generally involves an incision in the top or side of the big toe joint and the removal or realignment of soft tissue and bone. This is done to relieve pain and restore normal alignment to the joint. Small wires, screws, or plates may be used to hold the bones in place. Q: How can I get rid of a bunion without surgery? Wear Wider Shoes: Changing your shoes can help take stress off of your big toe and allow the bunion to heal. Use Pads or Shoe Inserts to Correct Your Foot’s Position in case you pronate or supinate. Fix your feet posture when exercising. Manage pain naturally with curcumin. Use shoe inserts to help position the foot correctly. Q: Can bunions cause lower back pain? A: Stiffness and discomfort in the lower back are the result. Other conditions caused by over-pronation are misaligned bones, hammertoes, bunions, and knee pain. Surprisingly, treatment for lower back pain related to foot problems is usually easy to treat. Q: Can bunions cause foot pain? A: Bunions may or may not cause symptoms. A frequent symptom is foot pain in the involved area when walking or wearing shoes; rest and/or change to a wider shoe relieves this pain. Shoe pressure in this area can cause interment pain while the development of arthritis in more severe bunions can lead to chronic pain. Q: Can bunions cause numbness in feet? A: Bunions can be exacerbated by wearing shoes that restrict or crowd the toes. The side of the bump can become exceptionally painful and inflamed. Other symptoms of developed bunions can appear as a burning sensation, numbness of the toes and in some cases, numbness pains in the feet. Q: Can bunions cause pain in ball of foot? A: Metatarsalgia is caused by increased pressure on one or more of these bones, which leads to pain in the ball of your foot. A number of factors can increase pressure on the metatarsal bones including wearing shoes that do not provide enough support or cushioning, being overweight, or having bunions or hammer toes. Q: Can bunions cause knee problems? A: Bunions deformities at the base of the big toe that can cause pain and disability. Bunions are common and can really slow a person down. Recent studies found: Participants with bunions were more likely to experience pain in other parts of their body, including the hip, knee, low back, and foot. Q: What are orthotics for bunions? A: For those who opt out of surgery, mid-foot braces, orthotics, and toe spreaders can be helpful. The Mid-foot Arch Support Brace by Bunion Aid takes pressure away from the painful bunion while wearing shoes. The side splint supports the metatarsal bones. Q: Do splints work for bunions? A: A bunion splint usually holds the big toe in place with a loop, which is connected to a binding around the mid-foot. Toe spreaders that fit all of your toes are somewhat more helpful, as they re-align all of the toes in the foot. They can provide relief for your sore foot in as little as 30 minutes. Q: What are the benefits of toe separators? A: Additionally, toe separators have the ability to improve circulation, realign joints and straighten bent toes, which can also help with foot pain. Other benefits of toe spreaders and separators include their ability to improve balance, gait, posture and the overall appearance of the foot.